'Glee' Gay Re-Cap: Brittany's a Bi Unicorn! While the Glee Gay-Caps usually recap Ms. Santana Lopez's flirting with coming out, she was only a supporting role is this episode. This week’s story revolved a great deal around a pretty gay storyline with Kurt’s coming to terms that he may just not be butch enough to play the leading man. However the episode did feature the apple of Santana’s eye Brittany (Heather Morris) emerging as a confident leading player and a proudly out bisexual unicorn, but we’ll get to that later. While the Glee Gay-Caps page is typically devoted to recapping one Ms. Santana Lopez’s flirting with coming out, she only played a supporting role in the week’s episode since Mr. Shue banned her from glee club for setting a piano on fire – long story. This week’s story revolved a great deal around a pretty gay storyline with Kurt’s coming to terms that he may just not be butch enough to play the leading man -- ever! However, the episode did feature the apple of Santana’s eye Brittany (Heather Morris) emerging as a confident leading player and a proudly out bisexual unicorn, but we’ll get to that later. The episode kicks off with Brittany showering Kurt (Chris Colfer) with compliments before admitting that she’s just itching to run his campaign for class president. “Out of all the kids at this school I think that you are the biggest unicorn.” Brittany says, in true esoteric Brittany fashion. But Kurt doesn’t quite grasp Brit’s latest compliment. “Well, when a pony does a good deed he gets a horn and he becomes a unicorn, and he poops out cotton candy until he forgets he’s magical and then his horn falls off,” Brittany explains, without really enlightening Kurt in the least. “That’s a terrifying story,” Kurt says, looking skeptical. But Brittany clarifies, and this time she makes more sense. “A unicorn is somebody who knows they’re magical and isn’t afraid to show it. You went through hell last year and you never forgot how special you were,” Brittany says in her finest moment just before adding, “And I’ve slept with a lot of people and I’m really popular so I think I can get you mega-votes. Cut to Brittany unabashedly sporting a unicorn horn while revealing her campaign poster ideas to Kurt. And while the posters exhibit a certain amount of attention-grabbing sparkle, Kurt’s none too thrilled by his likeness being adorned on pink paper and surrounded by NOH8 and “ride the rainbow” slogans. As creative and flat-out fun as Brittany’s ideas are Kurt objects. “I don’t just want to be known as Kurt Hummel – homo,” he says. “What’s wrong with that? 99 percent of the kids in this school are either freaks or closet freaks. The captain of the football squad- he gets the job but he doesn’t represent the people. That’s why we need a unicorn,” Brittany says in her dimly brilliant way. Still, Kurt wants to tone it down with a classic black and white photo of him in a tux for the campaign poster. Much later, after Kurt’s auditioned for the leading man role of Tony in the McKinley High production of West Side Story –- with an over-the-top Barbra Streisand no less -- and he’s overheard the musical’s directors, Artie, Coach Bieste and Miss Pillsbury, discussing his relative butchness – or lack thereof, Kurt spies Brittany and Santana taping up some pretty gay posters starring Kurt riding a unicorn in his bid for the presidency. And he’s not happy about it. He rips a poster of the wall and darts toward Brittana to chastise them. “This is not the poster that I wanted,” Kurt shouts. “The poster that you wanted gave me crippling depression,” Brittany blurts. “I wanted something toned down,” Kurt continues to say. And at this point it’s about time for an injection of Santana pragmatism. “This is toned down,” Santana says, whirling around from the poster to face Kurt. “In the original the unicorn was riding you.” Stop—rewind the DVR. Did she just say that? Brittany attempts to convince Kurt that he’s special and the posters reflect that but he bemoans the fact that he doesn’t think he’ll win. Just then Rachel walks by and Kurt grabs her by the arm to beg her for help with re-auditioning for Tony. A dejected Brittany tells Santana she failed her “precious unicorn.” But Santana loves her Brit so she’s there to support Brit telling her the campaign is brilliant. Following a failed attempt to woo the West Side Story triumvirate of directors with a staged reading of Romeo and Juliet with Rachel as his costar, Kurt seeks advice from the man who knows him best of all – his dad. In a nutshell, Kurt’s dad suggests that he should stop trying to be something he’s not and that if he wants leading roles he’ll have to write and create his own rather than rely on the straight romantic leads that have been the cornerstone of drama for centuries – and truer words were never spoken. 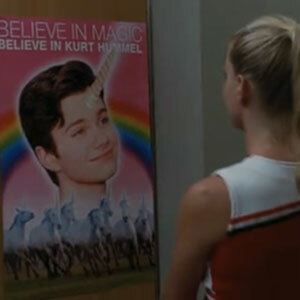 Later, Brittany is ambling down the halls of McKinley when she happens upon new unicorn posters of Kurt for president replete with a horn coming out of his head and with the slogan “Believe in Magic.” It appears Kurt’s dad had an impact. Brittany turns to see the magical unicorn himself tacking up the posters. Kurt tells Brittany she was right all along. “I need to celebrate who I am and I am a unicorn,” Kurt says, and Brit hugs him. Invigorated by his decision to embrace the gay Kurt invites Brittany over after school to do oatmeal facials, watch Project Runway and talk campaign strategy but it turns out Brittany has plans of her own. “I can’t. Santana and I are working on campaign posters,” Brittany says. “For my campaign,” she clarifies. “I decided to run too, cause, you know, the last six class presidents, they’ve all been guys and look where that’s got us, you know, teetering in a double-dip recession, ” the sage Brittany says. “Besides, I’m also a unicorn,” she says. “Maybe a bi-corn,” Brittany adds, in recognition of her bisexual leanings. “Anyway, I’m starting to believe in my own magic. Good luck Kurt. 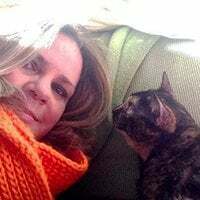 I will see you at the debate,” she says, gleefully turning on her heel. And that about wraps it up for this week’s Glee gay re-cap, except to mention that it was delightful to see Idina Menzel return as Rachel’s bio mom, the mom who adopted Quinn and Puck’s baby and as a private glee instructor to the tone-deaf heiress Sugar Motta. Her duet with Lea Michelle’s Rachel on “Somewhere” from West Side Story proved to be an inspiration to show queens with Menzel / Michelle crushes everywhere. But back to Brittana for a moment, while there was barely a Santana fix in this week’s episode, here’s hoping Brittany and Santana find love on the campaign trail. They are each other’s unicorns after all.